Royal Stanley, Fine Bone China, Staffordshire England - Antique Bone China Query:- Hi, I'm not sure if you will be able to help me but a few years back at an antiques fair I purchased a small dish, I'm not sure what it is meant for. The base size is as large as the palm of my hand. I have searched your site in vain as well as other international sites for the mark underneath the dish and come up a blank. It is stamped underneath with: Royal Stanley, Fine Bone China, Staffordshire England and the mural on the lid is signed D.Wallace. The colours are all very vibrant and there are no chips. The only similar items I have come across on the internet is the Royal Worcester brand. My searches keep coming up with Royal Stanley "Ware" which has an entirely different stamp so I assumed they are not related. Is there anything you can tell me about my dish, it may just be some cheap knock off, but it is a gorgeous little piece and I have never come across anything like it again either at antique fairs or on the internet. I have attached some photo's for you. I look forward to your reply and any information you can provide. Many thanks for your intriguing query. Colclough is one of my favorite companies, and so I was initially puzzled by your backstamp which is one I have never seen before and is not recorded in any of my reference books. 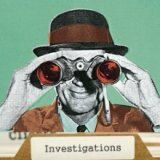 Let's look at the evidence! "Established 1878"??? is the first clue to look at. If you know the history of the 'Royal Stanley' pottery mark, which I briefly outline below, you will see there was no '1878' date that I can find. There are several other things that are 'off'. For example, the real antique Royal Stanley is not fine bone china at all, but the 'Art Nouveau' style products of an earthenware plant owned by H J Colclough (see below for more details). There was an authentic antique maker of bone china items called 'The Stanley China Works' (Charles Amison & Co Ltd - not any connection with Colcloughs that I know about). Note, there is no use of the word "Royal" in any Amison pottery mark in any of my reference books I own. This company ceased trading in 1962. More on them later. Your mark does not fit into any of the pottery marks for Royal Stanley that I have. However, that is not to say the mark is not a genuine one. The short answer is I'm not sure exactly what it is you've got here! Identifications and valuations for vintage and fine china are specialist niches requiring vast amounts of knowledge and research material. This unique identification & valuation resource will allow you to see if the mark is identifiable by experts without you having to pay any money upfront. My service is unique online and is designed to protect my site visitors from wasting their time and money online. H.J. Colclough - see the main Colclough Bone China section for more info - had an interest in an earthenware works based at the Stanley Pottery, Longton (see Royal Stanley China). From 1887 to 1928 this “Stanley Pottery” firm, was known as ‘Colclough & Co’, as distinct from the main H J Colclough bone china firm. From 1928 Colclough & Co continued as the Stanley Pottery Ltd until c.1939. Now, this is where the records become a bit blurry. There is very little information as to what additional marks were used, but when I searched I found pottery marks saying - ‘The Stanley Pottery Co’ and ‘The Stanley China Works’. However, these marks, on investigation are completely separate firms. The Stanley Pottery Co. was based at Newport Lane, Middleport, Burslem and operated from c.1909-1937. They were most likely a brand designed for expert to America, not a domestic pottery mark. The ‘Stanley China Works’, based in Longton, run by the firm mentioned above, called Charles Amison (& Co Ltd). They produced bone china and porcelains from 1889 - 1962. Their pottery marks are distinct from Colclough’s “Royal” Stanley, not only in that they never, to my knowledge, carry the word “Royal”, but also in that apart from their earlier pottery marks, they carry the words “bone china”. Remember, Colclough’s Royal Stanley was an earthenware maker, not a bone china plant, which needs specialist kilns. So where does all that leave your un-documented Royal Stanley pottery mark? Could it be one of the ‘other’ pottery marks used by the ‘Stanley Pottery Ltd’ 1928 – c.1939. Why would they use the date 1878? Could it be a later Colclough mark used when they merged with Ridgways? Again, why would they have used the random date of 1878 instead of the real date of 1887? More questions than answers at this point!! However, when looking at the reference books, I overlooked one vital clue. That is; Charles Amison & Co Ltd, the makers of Stanley bone china (without the 'Royal') actually began life as Amison and Lawson in 1878. A eureka moment if ever there was one. This still does not explain why the makers of your wares, whether Amison or a successor, would start using the Colclough pottery mark of "Royal Stanley", rather than their traditional "STANLEY FINE BONE CHINA". Maybe it was a last ditch marketing effort in the 1960's to stay afloat? China antiquing is a noble and intriguing pastime, if sometimes somewhat complex! Hope this info helps rather than hinders. Just upload your pic here and we'll have a look at the mark. I can then have a look and add it to your comment above. I don't know when it was written, but I, too, have a milk jug (small, tea service jug) 3 cups, no saucers and 5 sandwich? plates, with a larger cake? plate. All stamped Stanley (under a crown) Fine Bone China and EST 1875. NO pattern name, but the cups have the number 474/10 hand written in orange, by brush, on them. The pattern is bunches of flowers (upside down, stems up) The other articles do not. These came through my mother and grandmother who worked 'in service' to a few grand families. Grandma was house keeper and Grandad was chauffeur to the family who were very close to Lord Leverhume at Port Sunlight, after WW1. I assume these were passed down to upper staff, on the introduction of a new service, or they had been reduced through breakage. It's strange that you (Peter) refer to 1887 as the founding year. Colclough & Co, Stanley Works - the originators of the 'Royal Stanley' mark. I have the remnants of my parents wedding china. They got married in 1956. The china is white with a 1" border of deep red and gold. The name on it is Stanley Fine Bone China, England est 1875 which sits underneath a crown. There is also a number which is 553/10. Can you tell me anything about my china? This 1875 date in association with the use of the Stanley Fine Bone China backstamp really is baffling me at present. As I state above, Amison and Lawson, the predecessors of Charles Amison who owned the Stanley China mark until 1962 were founded in 1878 by all the accounts I have access to, not 1875. Perhaps there was discovered an earlier short lived firm who came before? Even more confusing is the use of Royal Stanley 1878 on the original query because Colclough was the owner of the Royal Stanley mark and nothing to do with Amison as far as I know. Royal Stanley 1875 or 1878? Just checked on thepotteries.org and they say Amison was founded in 1875 (closed 1962). Goddens says 1878. Either way it looks like the maker responsible for the Royal Stanley mark of the original query above was Amisons. Why they used the "Royal" epithet is the real mystery. Were they amalgamated into the Pearson Allied Potteries Group (the owners of the the Royal Stanley name from c.1955 to c.1964), or did they just use the mark anyway, regardless of the fact the label was strictly speaking owned by someone else? Only an expert researcher could tell us. Anyone care to ask the Potteries Museum on ceramics@stoke.gov.uk ...? I have been banned from using their service because they deem me as a commercial website in their own little bureaucratic dream world they live in. If you care to help, just email them with photos and wait about a month for the rusty cogs grind into action. 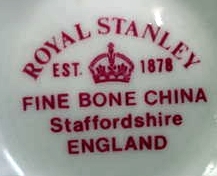 I just purchased a "Stanley Fine Bone China England - est. 1878" with a crown above "Stanley", all in green, with a number, looks like "1002/11" in red. On one side of the cup it has a maroon, pink, and yellow rose with leaves and on two sides inside the cup with gold trim on the bottom rim, top rim and both sides of the handle. I paid $.50, so anything I sell it for will be a profit, but I am curious for more information on this piece. Thank you! I recently came upon a plate in my mothers hutch and I have no clue about it's value. I'm planning a yard sale next month. If you can help me out that would be wonderful. Thank you very much. I wish to find out the sale value of a Stanley china tea set comprising 6 cups, saucers,5 side plates and 1 cake plate. Number 4197 Crown stamp on bottom and what looks like a tiny gold letter D. Inside and outside band of royal blue under gold lattice and rust flower and green leaf, dropping down to a lace pattern of rust rose to a white background, gold trimmed. I am in possession of Ye Olde Willow pattern by Crown Staffordshire. I notice on line that the very same piece could differ in dimensions. Is this due to different production dates? 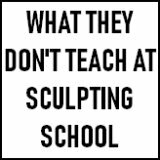 Is it due to the production process? Curious. I have saucers. My guess is that they may not all be saucers. Dessert plates, may be? Can you advise what is inclusive of this pattern to help identify the pieces? I have a milk/cream jug in white with navy blue and gold design and orange roses, the marking on the base is Stanley China, England with a crown in the centre, it does not say Royal or fine bone, could you tell me if its a copy or not as it has no date either. I am in the process of listing a Royal Standard footed cup and saucer set with the Month of September design. I found it listed at Replcements under Crown Trent. I have a cute Stanley tea set of cups, saucers and sandwich/cake plates in jewel colours with tiny polka dots and gilt edging. The cups only are marked with what I imagine is a pattern number, 9L0/10. From your site info I guess its 50's or 60's? I'd like to know more about value, cant find on the web or ebay, and extra pieces, were there tea pots, jugs, sugar dish etc? I'm new to all this, I only buy things that I fancy and that I will actually use, rather than for collection purposes. But I'm originally from Stoke so maybe ceramics is in my DNA? 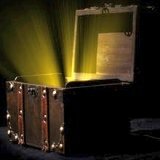 ps Great site, very helpful and good karma! Thanks for your contribution and kind words! As I explain on this page:- 'How to research your stuff', you can get a real feel for value if have a look around and get a feel for what things tend to sell for. For example, to get a retail price look at www.everythingstopsfortea.com for an idea of retail prices for a not particularly famous UK brand like Stanley. BUT!! Retail prices are about twice as much as an individual might get selling at auction, both on or off-line. Don't be fooled by optimistic 'buy-it-now' prices on eBay. Sellers often veer towards the retail price with those type of listings. It is the COMPLETED LISTINGS you need to look at on eBay. Sales at off-line auctions are listed on a site called www.liveauctioneers.com. You have to join, but it's well worth it as you can have an absolute blast searching for past sales of virtually anything and everything. I use this site virtually every day for values. Just take an average of hammer prices and bingo, you know your value, there or thereabouts. I would love to know the history of this set. I have been unable to locate info on a derby pattern. Maybe she read the date wrong. I have the same and at first I thought it read 1978. I believe it's really 1875? ?